It did. Thanks ALOT all i need was the Update URL tho..
A. Simply delete genpatch.ini and restart GenPatch which will create a new configuration file with all the default settings. where can i find that file genpatch.ini?? If your windows explorer is not configured to show extensions it will show it as: "genpatch" (mouseover description would be "configuration settings" or similar). Just thought you might like to know that I downloaded the installer and my virus scanner picked up two Trojans. Also, it keeps telling me that I need to put my computer into admin mode to install it but I AM in admin mode. Now I'm not entirely sure what steps to take from here.. Try to make it write able. I think its now read only. I am not good in english I need a simple way to install these pls. On a side-note, the current edit for WASD isn't working on v335 for me. But I'll mess with things to see. This also includes the other modifications. Edited by Rukario, 03 May 2011 - 08:05 AM. There is currently an issue with the Check All feature giving a Redirect error which I'm aware of (it was caused after the game website was moved to a new location), and am working towards updating my project files for GenPatch so that a fix can be implemented. As for the website status showing as offline, I am currently trying to get in contact with Rayun so that the status information can be updated. Edited by Genesis, 24 July 2011 - 11:48 PM. The issue with the redirect error on the Check All feature is a side effect of Gravity's patch list cleanup process and will hopefully be corrected once they have been notified of the data discrepancy. 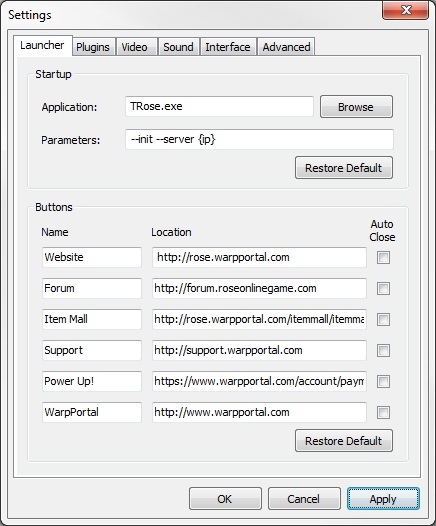 Would this give CRC mismatch error on a clean install of the rose game? Tried reinstalling everything from scratch and just using GenPatch to install the patch but 2nd time now and still getting the same error.. Full restall hasn't fixed it and the normal launcher is working fine so im not sure whats causing it. Improved detection of corrupt clients in preparation for future restoration function. Updating the user interface & web based functions. Addition of two extra customizable launcher buttons. Displaying Terms of Service notice once per patch in preparation for removal from the game client. Ability to restore default values for most options. Configurable options for Bloom Factor and Skill Bar Locking.